Visitor Index :: Visitors and societies are guaranteed to receive a warm welcome both on and off the course at this, one of the premier golf clubs in the north of England, holder of the Yorkshire Order of Merit award. With a rich history, modern approach to membership and lively social scene, Oakdale Golf Club is well regarded as one of the best golf clubs in the Harrogate area. Whether you are an expert golfer or just keen to try golf for the first time, you’ll find a warm welcome at Oakdale. 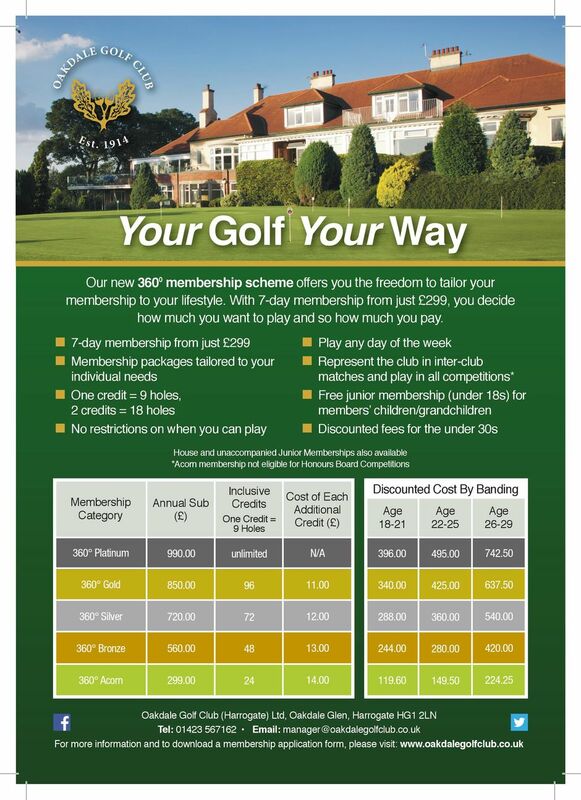 Come and experience wonderful golf and a friendly atmosphere at Harrogate’s most central golf course. Oakdale Golf Club is the only 18-hole golf course lying within the town boundaries yet enjoys a rural position in picturesque surroundings, free from traffic noise. Designed by the world-renowned golf course architect Dr Alister MacKenzie in 1914, the course is set in 130 acres of gentle valley, with elements of both parkland and moorland providing varied interest from the first hole to the last. Our members enjoy a thriving social scene with a welcoming clubhouse where you can enjoy a drink or meal while admiring wonderful panoramic views across the course and surrounding countryside. Regular competitions ensure there’s always plenty going on and during the quieter winter months, the clubhouse hosts regular quiz nights and other social events. Click here for contact details to arrange a visit and discover what makes Oakdale Golf Club so special. Unless otherwise stated Members dedicated tee times are Monday to Friday Sunrise to 09.30hrs; 12.00 to 13.30hrs and after 15.00 (Friday)16.00 hrs other days. All day Saturdays, Sundays and Bank Holidays.